Cheim & Read, in cooperation with the Joan Mitchell Foundation, is pleased to announce a comprehensive survey exhibition of Joan Mitchell's works on paper from 1956 to 1992. The show, unique in its scope and focus, is accompanied by a full-color catalogue with an essay by John Yau. It is co-published by Steidl. Joan Mitchell, born in 1925, was one of a handful of successful female painters of her generation. Known for formally abstract, expressionistic paintings, Mitchell explored the effects of line, color and light while creating works saturated with energy and emotion. After studying at the Art Institute of Chicago, where she received her degree in 1947, Mitchell moved to New York City. She exhibited in the renowned and historically significant 9th Street Show in the early summer months of 1951, and had her first solo exhibition at the New Gallery in 1952. Though influenced by the slightly older and trailblazing abstract investigations of Willem de Kooning, Jackson Pollock and Franz Kline, Mitchell was connected to her generation's response to and redirection of gestural abstraction. 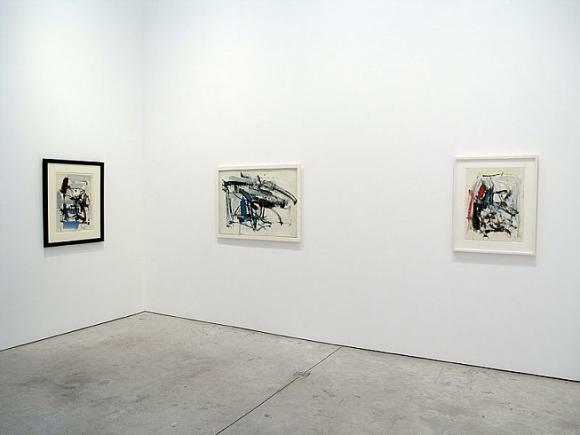 Sparked by elements and colors found in her surroundings—the circuitous line of the river, the specific blue hue of the sky—Mitchell's works on paper are charged with a concentrated reaction to her natural and emotional environment; they provide intimate evidence of a hand and mind in motion. As John Yau writes in his essay for the exhibition, "It is her singular achievement to have stripped her process down to the simplest means…in order to make her work allude to something far larger than landscape, and that is the exigencies of life itself." Yau recognizes Mitchell's pastels as feeling the most connected to her process and personality, a medium in which she "reached many of her most reverberating heights." Pastel is a tricky substance to work with, unsympathetic to an unsure or overly heavy hand. It is often characterized by its powdery softness and fragility, and is commonly associated with the amorphous boundaries and sensitive, light dappled surfaces and subjects of Impressionist painters like Edgar Degas and Mary Cassatt. In contrast, Joan Mitchell's expressive, confident gesture redefines and renews the medium in bold, energetic layers of color. Yet her results also remain infused with attentive sensitivity to pastel's transient and fugitive nature. Areas are softly smudged, almost washed and watery-looking; the speed of her line reinforced by a blur of pigment. But as on an overcast day, a shocking clarity of color emerges and radiates against less distinct backgrounds. This tension of opposites is born from a combination of Mitchell's fierce toughness and sympathetic observation. The pastels offer a metaphor for the simultaneous resilience and fragility of human experience. Interestingly, the landscape in which the Impressionists took refuge is also the one that inspired Mitchell—she lived in France for the last three decades of her life, and died in Vétheuil (outside of Paris) in 1992 at age 67. Inspired by a deep connection to her surroundings and the specific light and feeling of a place, and determined by a profound awareness of her emotional landscape—what Yau refers to as her "interior weather"—Mitchell's works on paper resonate with the intensity, power and limitations of an individual while referencing the timelessness, formlessness and stillness of the natural environment.